Once the Chinese had started making comparatively inexpensive paper from natural fibers, and invented block-printing, paper money came into use in the country. The first known use of paper money in China is reported from the Tang dynasty, but it was during the Song dynasty that the practice became institutionized and adopted as a govermental policy. Scarce information remain about this early system of paper money, but we do know that the government officials that issued it wrote and printed names and seals on the money. Compared to traditional money made from precious metals, paper money was easier to transport, and the use of paper money also freed up metal that could be put to other use. As mentioned above, the earliest known use of paper money in China is from the Tang dynasty. This dynasty lasted from the year 618 to 907 AD, and paper money appeared around year 800. 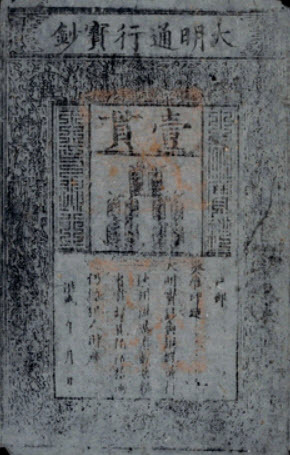 This money, known as “flying cash”, were certificates issued by the Tang government to pay local merchants in distants parts of the empire. By using certificates, the government could avoid having to transport metal money far away. The local merchants called the certificates “flying cash” because unlike metal money, these paper documents had a tendency to blow away when it was windy. Each certificate had a certain amount of money stated on it and was redeemable for metal cash on demand in the Chinese capital. Most merchants never went through the trouble of going to the capital to get cash for their certificate, instead the certificates were used as money locally, since they were transfereable. Real paper money was introduced early during the Song dynasty (960-1279) by a group of wealthy merchants and financiers in Szechuan. Notably, Szechuan was the province where Chinese printing first occured. 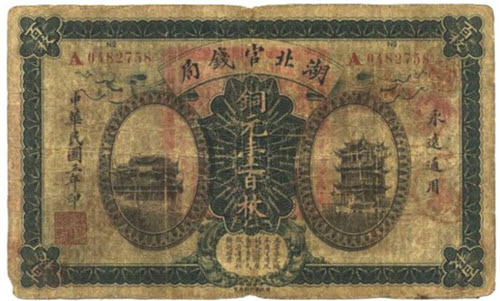 The Szechuan paper banknotes quickly gained widespread acceptance and were widely circulated. Each banknote issued by the Szechuan group was printed with pictures of houses, trees and humans. Then, red and black inks were applied intermittently, before affixing the seals of the issuing banks. Also, confidential marks were made on each individual banknote, to make counterifitting even more difficult. The holder of a banknote had the right to have it converted into metal cash at any time in any of the issuing banks. In 1023, the Chinese government enacted a new law – from now on, only official banknotes created by the government were allowed. As a consequence, the Szechuan banknotes were withdrawn. The government issued paper banknotes had cash backing, and could be exchanged for standard metal coins, but the government also made sure that you could always take your paper banknotes to one of the government run shops and exchange them for salt or liquor. Paper money was still in use in China when the Venetian explorer and trader Marco Polo visited during the 13th century. Polo, a merchant himselve, was so fascinated by the monitary system that he wrote about it rather extensively. His book includes information about aspects such as production, valuation and usage. When Chin occupied northern China in 1115-1234, they followed Song’s example and issued paper banknotes. The Bureau of Paper Currency in Kaifeng was established in 1154 as a central agency in charge of all Chin banknote issues. Each issue was valid for seven years. Unlike the Song, the Chin didn’t bother to back the currency with cash or commodities, and inflation soared. Also, we know of at least a few attempts of counterfeiting. In 1183, a printer who was found guilty of counterfeithing 2600 banknotes in six months was sentenced to death. In the mid-1200s, the Mongols took over China and established the Yuan dynasty, which was to last to 1368. The Yuan ruler started issuing paper banknotes in 1260. The highest Yuan denomination for paper money was 2 strings, and the lowest 2 standard coins. Just like the Chin dynasty before them, the Yuan dynasty soon ran into problems with inflation, and from 1260 to 1309, their paper money depreciated by 100%. In 1272, old issues were converted into a new issue at the ratio of one to five. This new issue consisted of banknotes printed with copper plates instead of wood blocks. Yet another conversion took place in 1309. It was fairly common for the Yuan government to refuse to honor old certificates that were considered to worn out.